Greetings from owners Mark and Pam Leathersich and welcome to our website! If you like to always look your best or feel proud of your sense of fashion and style, then selecting your new carpet or flooring should be no different. At our store you’ll find more than a handful of discounted products. You’ll find a whole new world of products to choose from. If you want your hardwood floor to be something different, how about TIGER WOOD or a great HAND SCRAPED look? How about wood made out of old WINE BARRELS? Check out the Armstrong Wood Display. Want to make that dull looking bath come alive? Check out Alterna LUXURY VINYL tile with a LIFE WARRANTY! We have the right product at the right price, just for YOU! The “GREEN” movement has quickly become more than an environmental thing. It has become a fashion of its own. Flooring is no different. We feature a wide variety of carpet products that either utilize recycled yarn or will never see a landfill. If “Green” means natural materials to you, let us show you bamboo flooring. Each has its own contribution for making your home a part of the “GREEN” fashion trend. The first thing you notice in our showroom is that we have A WIDE SELECTION OF CARPET AND FLOORING ON DISPLAY! Other stores have come in to “check us out” to see just how we do it. We promise NO NAGGING SALESPEOPLE! All of us are NONCOMMISSIONED. Our goal is to make your shopping experience more pleasurable than any other store in the area. Our assortment of products include quality carpet, ceramic tile, hardwood flooring, laminate flooring, vinyl, linoleum and window treatments by Hunter Douglas. Mark and Pam Leathersich, owners, started the business in 1983. Mark has over thirty years of experience. We do commercial as well as residential. Our staff offers flooring knowledge not found in the large national chain stores. Because we are locally-owned, we want to help you make the right flooring and installation decisions for your home and ensure your satisfaction for years to come. Take Out the Carpet & Flooring Samples! Many stores don’t want you to take out samples! But, how can you know the carpet will really match your decor? 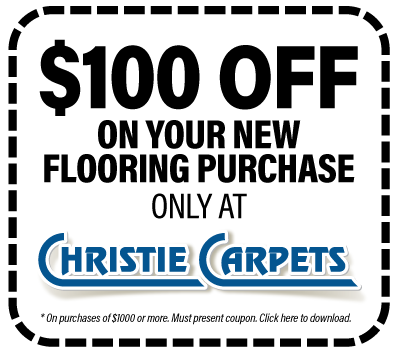 At Christie Carpets, we want you to make the correct decision, because your floor is a fifth wall. In fact, you look at it more than your walls!